Photo: Joan Johnson in restored First National Bank, Tampico, Illinois. MARCH - Open weekends only. Saturday: 10a.m. - 4p.m. & Sunday, 1p.m. - 4p.m. **NOVEMBER & DECEMBER - Closed (or by appointment). Please call 815-622-8705 or email reaganbirthplace@thewisp.net to schedule an appointment during these months. President Ronald Reagan was born in Tampico on Feb. 6, 1911 in an apartment above a bakery. The bakery was purchased by the First National Bank in 1919 and continued as a Bank until the 1930's. The apartment where he was born has been refinished to look as it did when he was born there. The bank has been restored to again look like a working bank of the early 1900's. The store located to the South of the Bank originally was a grocery store and now houses the gift shop for the Reagan Museum. When Ronald was 4 months old, the family moved from the apartment to a house on Glassburn Street. The house is located across the street from Reagan Park (originally known as Railroad or Depot Park). Ronald and Neil played on a cannon in the park as young children. He referred to the park and the cannon in several of his stories. When he was 4 years old, the Pitney Store, where his father, Jack Reagan worked, was sold and the Reagans moved to Chicago where Mr. Reagan worked for a short time at the Fair Department Store. 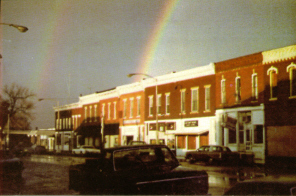 The family then moved to Galesburg, where Mr. Reagan was employed as a store clerk. While there, Ronald learned to read at the age of 5, before starting to school. He attended Silas Willard School in Galesburg and skipped grade 2. The family then moved to Monmouth for a short time. They were called back to Tampico for Mr. Reagan to again work for Mr. Pitney, who had acquired his old store back. The family lived above the Pitney Store until moving to Dixon in December of 1920. Photo: Double Rainbow over Ronald Reagan's birthplace in Tampico, IL on Election Eve. Ronald was given this picture, which he was known to keep in his desk drawer. He would take it out when he needed some inspiration. FYI: The Ronald Reagan Birthplace/Museum and the Tampico Area Historical Society are two separate organizations and at two different locations. The Tampico Area Historical Society is located at 119 Main Street, 3 doors south of the R. Reagan Birthplace/Museum, 111-113 Main Street. 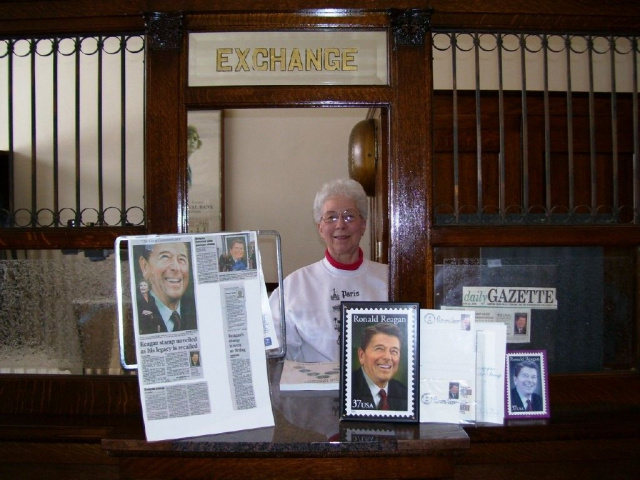 The Ronald Reagan Birthplace is located in an APARTMENT upstairs from the 1st National Bank. Tour begins in Gift Shop at 113 Main Street.